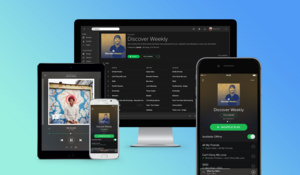 Spotify has been steadily gaining ground for years but many expected that Apple's unveiling of the new Apple Music two years back would change the dynamic radically. Nevertheless Spotify has been gaining momentum even with the world's largest tech company on its heels. The Swedish streaming company might not be very profitable but it is definitely the biggest. Spotify boasts now over 60 million paying customers while the closest competitor, now Apple Music, is at mere 27 million. In addition to paying customers Spotify has over 80 million free tier users that it tries to, and obviously succeeds to en extent, turn into monthly Premium subscribers meanwhile collecting ad revenue, albeit at less than adequate rate. Even though there's a lot to be done to eliminate the free tier altogether, if it's in the plans or even a possibility, Spotify has managed to decrease the free-to-paying ratio. A year ago twice as many Spotify's users were using free tier compared to Premium, with less that 30 percent of users paying for a subscription. Ratio has decreased from more than 2:1 to 1.33:1. One can estimate that soon the number of paying subscribers will be overtaking that of free tier users. In fact, if the same rate continues it'll happen around this time next year, and some would consider that a pessimistic evaluation, especially in the wake of news about expansion to new type of content. According to Bloomberg, Spotify is considering investing heavily in podcasts that have been largely dominated by Apple's iTunes. Even though podcasts have been around for ages, they've really been making a mark in the recent years. It would seem like an easy move but luring in podcasters from an established platform and educating listeners about a new feature is never going to be simple. Fortunately for Spotify, uploading a podcast to one more, in this case very significant, platform is not necessarily a tough ask. Paying for music is too weird for me to even contemplate.